The Campaign for Real Ale’s ‘National Pub of the Year’ award, won last year by the Salutation Inn, is staying in Gloucestershire. The 2015 winner is Cheltenham’s Sandford Park Alehouse. The town centre pub, which only opened its doors in April 2013, is now officially the best real ale pub in Britain. The winning pubs are judged on their atmosphere, decor, welcome, service, value for money and customer mix, but most importantly – quality of beer. The award usually goes to a ‘traditional’ pub. However, the ‘Alehouse’ is a modern, light, town centre pub which appeals to traditional and younger customers alike across all social, gender and age groups. Located at the far eastern end of the High Street, the pub has a main U-shaped bar area with a separate snug at the front and an upstairs function room. The rear beer garden backs onto the river Chelt and Sandford Park. 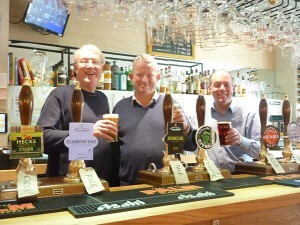 “Sandford Park Alehouse owner-manager, Grant Cook, said: “This is fantastic news for us. The whole team is thrilled to win this most prestigious of pub awards and we really appreciate the recognition. We know that many hundreds of people in more than 200 CAMRA branches around the UK were involved in selecting and evaluating candidate pubs for this award and it is, frankly, amazing to emerge from this process on top. Grant Cook and his team have built a strong reputation for quality and choice: the number of different draught real ales served has passed 1,400. In addition to the regularly changing real ales there are 16 craft keg ales and 80 bottled world beers, as well as a good range of food. Cheltenham Branch Chair, Rob Coldwell, said: “This is the third time a Gloucestershire pub has won the National Pub of the Year award in nine years, since the Old Spot Inn, Dursley, won in 2007. It’s fantastic news for Cheltenham; the last few years have seen big improvements in the trade. There are so many good pubs here now, and the range and quality served in Cheltenham rivals the established real ale destinations of Bath and Bristol. “It’s hard enough to achieve success with an established pub, but Grant opened the Sandford Park Alehouse as a brand new pub. Starting completely from scratch to reach the level of National Pub of the Year (in less than three years) requires tremendous hard work, a commitment to quality products and unflagging customer service. Waheeeey! Fantastic news, Grant, and you look almost as young as when you left us at Surrey/Hants Borders!